“Nature Deficit Disorder.” Oh no, no please, not another disorder. We seem to be slapping acronyms and prefixes of dysfunction on our children as quickly as we can think them up. We’ve got AD, ADD, ADHD, ADD-RT, AC/DC; our kids are dyslexic, dysgraphic, dysphasic, dyspeptic, disaffected, disgruntled. I’m not dismissing these afflictions – I think they are real enough, even if over-diagnosed and over-medicated – but do we really need yet one more? 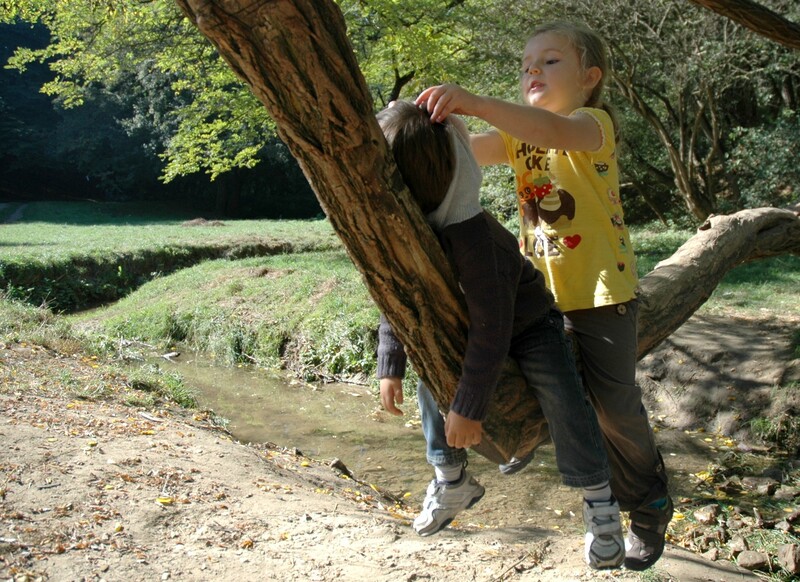 The term NDD was coined by Richard Louv in his 2005 book Last Child in the Woods, to describe the whole panoply of problems that arise when kids don’t receive enough exposure to the natural world. The media-immersed lifestyles of today’s young people (American children aged 8-18 spend on average 7 hours and 38 minutes using entertainment media per day), and the resulting lack of contact with the world outside their windows, have contributed to many of the chronic concerns we see today, including childhood obesity, diabetes, asthma, depression, anxiety, and poor academic performance. Academic performance? Yes, getting children to engage in the natural world has also been shown to improve their studies. “Take the development of cognitive functioning,” Louv says. “Factoring out other variables, studies of students in California and nationwide show that schools that use outdoor classrooms and other forms of experiential education produce significant student gains in social studies, science, language arts, and math.” Nature, it would seem, is good for your brain. Immunologist and microbiologist Dr. Mary Ruebush, author of Why Dirt is Good, goes on to say that “if your child isn’t coming in dirty every day, they’re not doing their job. They’re not building their immunological army.” She also, along with a growing number of health care professionals, recommends the absolute avoidance of that most ubiquitous of cleansers, antibacterial soap. Plain soap and water are just fine, and don’t contribute to the development of new strains of antibiotic-resistant microbes. 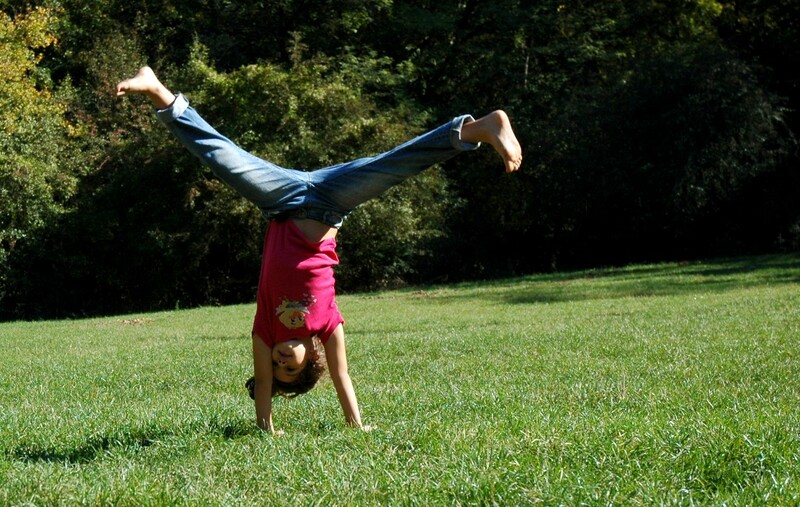 As if that’s not reason enough to get your kids unplugged and outside, interaction with nature promotes the production and release of serotonin and dopamine, biochemicals that provide a sense of relaxation, safety, and general well-being. This lengthy preamble serves as in introduction to what we did this weekend. A couple of weeks ago I wrote on the Facebook page of my kids’ school that I wanted to start a hiking club, in part to get our children outside, and in part to get to know new parents. 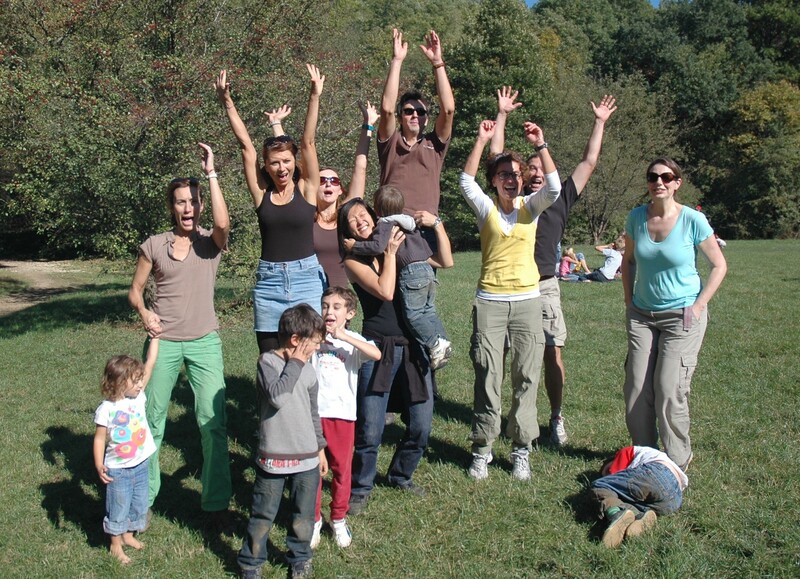 This Saturday, about thirty of us took a nature walk along a small stream outside of Budapest. 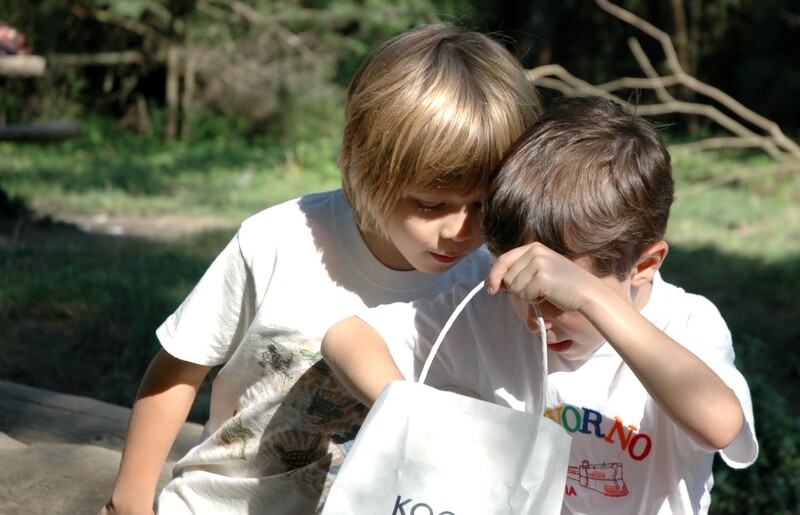 The kids were put into pairs or small groups, given paper bags and a list of natural items, and sent off on a scavenger hunt. The reactions of both parents and children were interesting. The kids, of course, raced off immediately to find objects on the list. Some of the parents anxiously watched as their kids disappeared around a bend in the trail, then went chasing after them. Some tried to keep their little ones clean. Not muddy their shoes. Not get their feet wet. Not perch perilously on trees limbs. But in time the parents visibly relaxed. It was clear in their facial expressions, their body language. They stopped hovering over the kids. They stopped worrying about clean shoes. Some stopped worrying about shoes altogether, and let their kids go barefoot. By the time we reached the meadow where we were planning to picnic, the kids were climbing trees, splashing in the brook, teetering their way over narrow natural bridges. It was a glorious Indian summer day, and the parents reclined on blankets, chatting, while the children did cartwheels and chucked rocks and ottered down slippery slopes and did all the things kids do when let loose outside. If you’re interested in reading more by Richard Louv, here’s an excellent article, “Leave No Child Inside,” that appeared in Orion Magazine. I thought the title said ‘CUTE maybe right outside your door’…which is pretty awesome as well. Nice article! We all seem to lose our connection with nature & are distracted by flashy bulbs of entertainment. 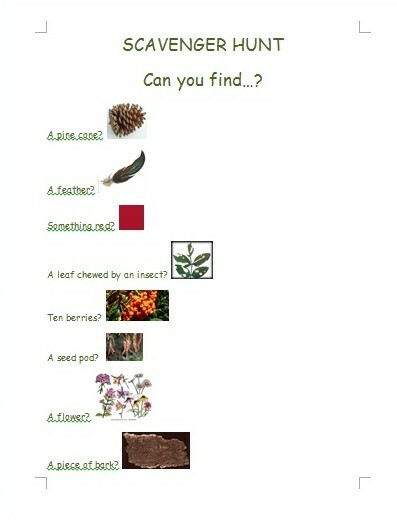 Your scavenger hunt looked like fun. 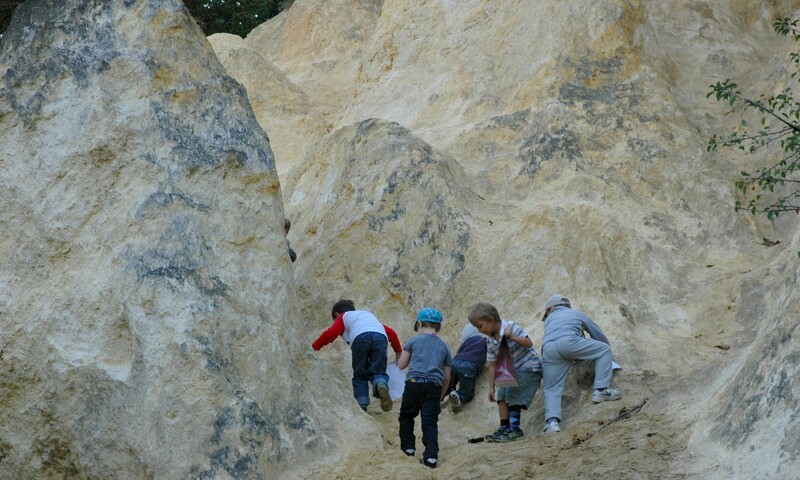 So happy to hear you are starting the hiking club to get kids outside and discovering again. I am relieved to learn that word is getting out about the perils of anti-bacterial everything…and the pleasures and benefits of embracing nature. 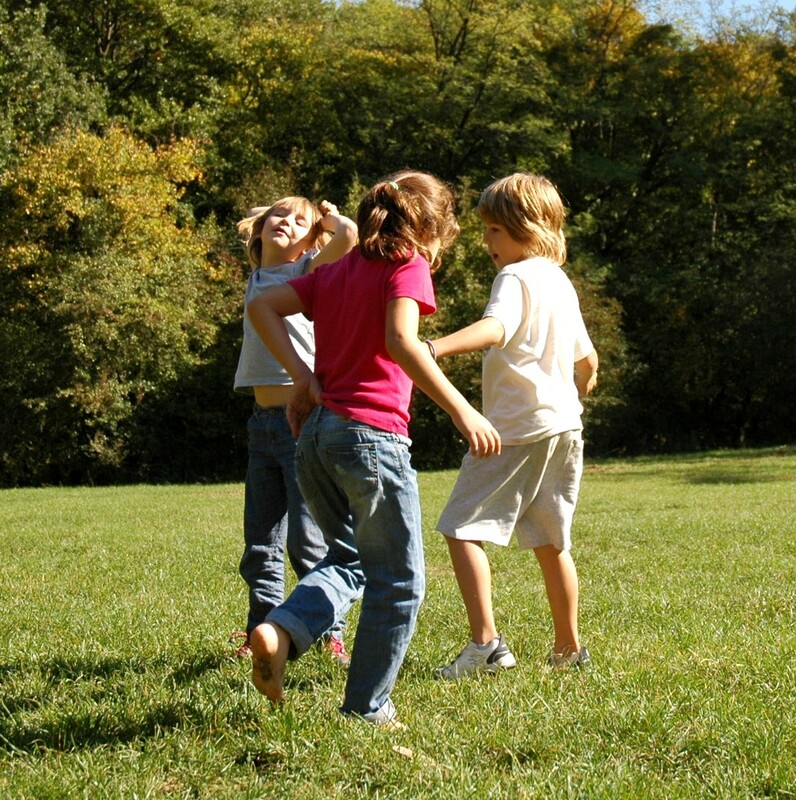 There’s a growing movement in the US to get kids outdoors, but it’s an uphill battle. 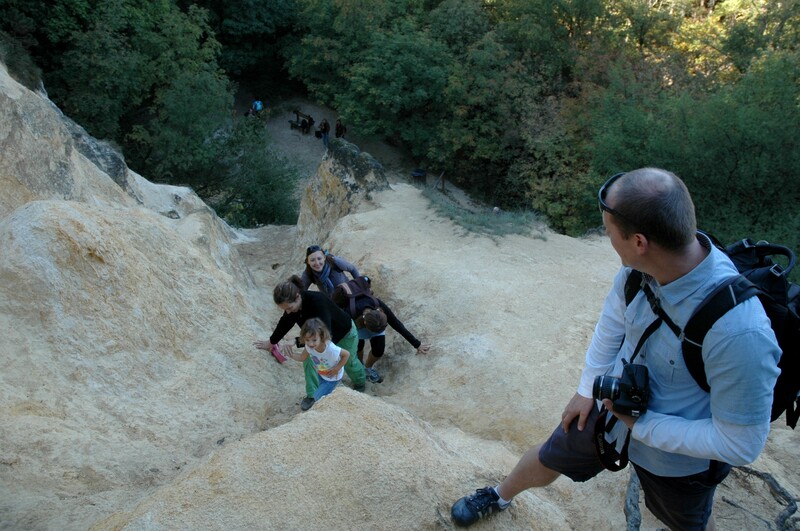 A steep uphill battle. But one worth taking on, I think. Good on you for setting up the hiking club! It seems the invitation to join a group is a great way for parents to overcome the feeling that it takes a lot of effort to get outdoors. Too bad more parents don’t recognize the importance of doing so! Thanks, Wanderlynn! The parents of one little girl told me that it was their first time – ever – going for a walk in the woods. EVER. A few days later that little girls came up to me when I was picking the boys up at school and said, “That was the best Saturday. EVER!” I was, as you might imagine, rather pleased. Great post! I’m big on trying to connect the outdoors with everyone. 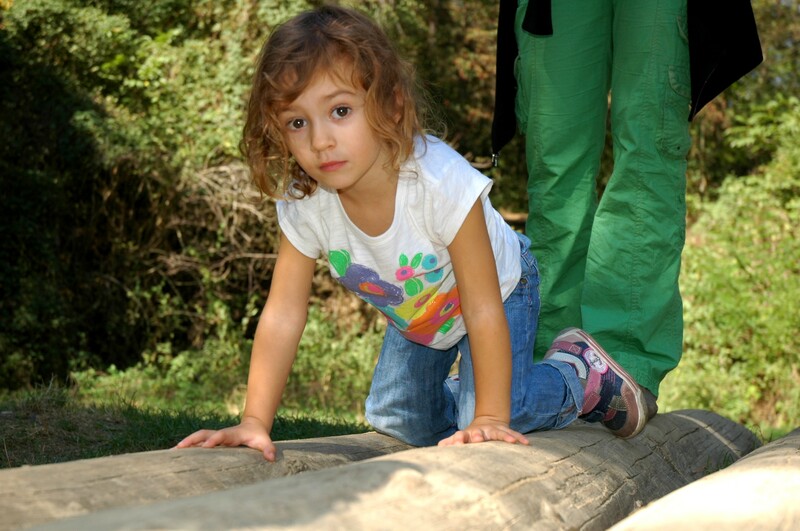 I enjoy and work in Environmental Education and am always looking for new ways to get kids out of doors. I agree and I don’t with being outdoors can help kid’s immune systems. I played in the dirt everyday as a child and I have an auto immune disorder. On the other hand I firmly believe that being surrounded by nature is a huge treatment for my symptoms, though not a cure. It may have not worked for me as a child but I still know it can help to be outside. Just today I had stated the fact that our generation can look at a logo from a fast food chain, for example, and tell you which one it is but shown a picture of a leaf and they had no idea what kind of tree it came from. From that, an older gentleman told me “a tree is just a TREE!” Old does not make you wise, which is why it is so important that our younger generation get involved! Thanks, Outdoor Mama! In my research I actually came upon a quotation from someone from the nature conservancy that said that kids can recognize 10,000 corporate logos but not 10 plants in their back yard. Now, I don’t know where she got that number, and I think it’s pretty dubious (10,000? I doubt it), but the point is entirely valid. When you start to look into the subject, the benefits for kids of being outdoors is staggering – this post barely scratched the surface. But keep up the good work in Environmental Education – you make a difference.